Do you like Takeover? Share it with your friends. The game Takeover" takes place in a mysterious fantasy world inhabited by decent people, who suffer under the cruel reign of their malicious ruler. Become the leader of an uprising and try to return the control of the world back to the hands of decent citizens. 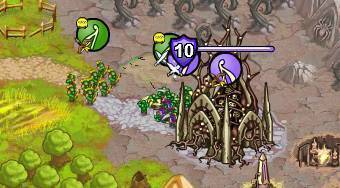 Send your brave fighters to the game landscape and try to seize the greatest possible part of the territory.